Big, ruffled, bell-shaped blooms of florist gloxinia are available in a rich range of colors -- red, burgundy, pink, white, violet and purple. Some varieties have blooms edged in white, or have a contrasting spotted throat color. Its velvety flowers are carried on slender stems above a rosette of large, oval, hairy leaves with scalloped edges. 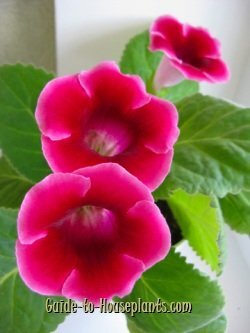 Originally, these showy gloxinia flowers were only grown from tuberous roots that went dormant in the winter. The tubers were then replanted for another seasonal show of flowers. Today, many gloxinias sold in florist shops were bred to grow from seed. These seed-grown hybrids produce better blooms because they don't devote energy to their root systems. However, their ability to come back after a dormant period is likely to be poor. They're treated as annuals and tossed out after one blooming season. Each flower lasts about a week, with continuous blooming time lasting several weeks. After flowering, water lightly until the leaves die down. Then, allow the soil to dry out and overwinter the tuber in its pot. Keep it cool (about 50°F/10°C) during this dormancy. Repot tubers in spring. 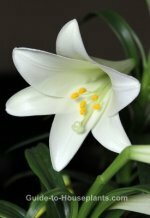 Plants grown from tubers can be stored in a cool, dry place for the winter and made to bloom the following year. To make the plant bloom again, pot the tuber hollow side up on the surface of fresh soil. Moisten the soil every few weeks. 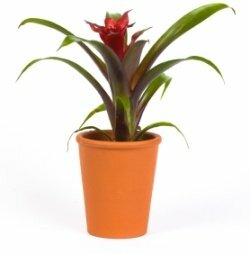 When you see new growth, place the pot in bright light and begin watering and fertilizing regularly. Dropped buds? Dry air and drafts may cause the flower buds to drop off before they open. Gloxinias are native to South American rainforests, where the relative humidity stays well above 70%. Short of turning your home into a misty rainforest, there are a few things you can do to raise the humidity for your plant. 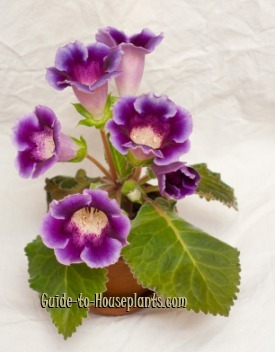 Buying tip: Choose a plant with buds that are just beginning to open. You'll enjoy a succession of blossoms that will last for several weeks. Seed-raised varieties include 'Glory', a compact plant, and 'Brocade' with double flowers. Light: Bright light; no direct sun. Water: Keep soil evenly moist. Provide good drainage or the roots may rot. Avoid getting the velvety leaves of this plant wet. Water will cause brown spots on the leaves and they won't come off.If the leaves need to be cleaned, brush them gently with a soft, dry brush, such as a small paintbrush.Remember to always use room-temperature water when watering your plants. Humidity: Moderate humidity. Set plant on a tray of wet pebbles or use a room humidifier. Do not mist because misting could damage the flowers and leaves. Soil: African violet potting mix works well to hold moisture. Fertilizer: Feed every 2 weeks while the plant is growing and blooming with a high-phosphorus liquid fertilizer diluted by half. Propagation: Seeds; leaf cuttings; division of tubers.